Each flower in the South Philly Peace Garden represents a life taken by gun violence. Tennille Hannah, the leader and founder of the Peace Garden, understands that mothers who have lost children would “rather come and sit and watch a flower grow than go to the cemetery and watch a stone.” Having lost her brother to gun violence when she was 14, Tennille’s empathy for grieving mothers comes naturally. The tragic losses suffered by her family and neighbors have fueled Tennille’s drive to create a small green sanctuary in the Grays Ferry neighborhood that she has called home for the past 41 years. In 2012, Tennille contacted Councilman Kenyatta Johnson’s office with the idea of creating a garden to memorialize victims of gun violence. The Councilman loved the concept and asked her to spearhead the project. The Pennsylvania Horticultural Society helped Tennille conduct a search for vacant lots that could fulfill this mission. Before it was a tranquil garden, the properties at 2702 and 2704 Wharton Street used to be a vacant lot that attracted dumping. After receiving the green light from the City, Tennille rallied her neighbors through the Philly Spring Clean Up to start clearing the site. She recalls those days as some of her favorites in the three-year history of the Peace Garden. New and old neighbors of different backgrounds, ages, and ethnicities joined together in pursuit of a common goal – beautifying their neighborhood and commemorating victims of homicide. A lack of landscaping and construction expertise did not stop residents from braving sweltering heat to complete the project. Mural Arts chipped in to construct a children’s deck in the back and a pergola as the garden’s centerpiece. Not long after the neighbors cleaned the space and planted flowers in memory of lost loved ones, Tennille ran into two men outside the Peace Garden who were preparing to demolish it to build new houses. The city had inadvertently sold the land to a developer after granting permission for the community to use it. A passionate advocate, Tennille enlisted the support of Councilman Johnson who brought the Neighborhood Gardens Trust and the Philadelphia Redevelopment Authority (PRA) to the table to develop a plan to save the garden. 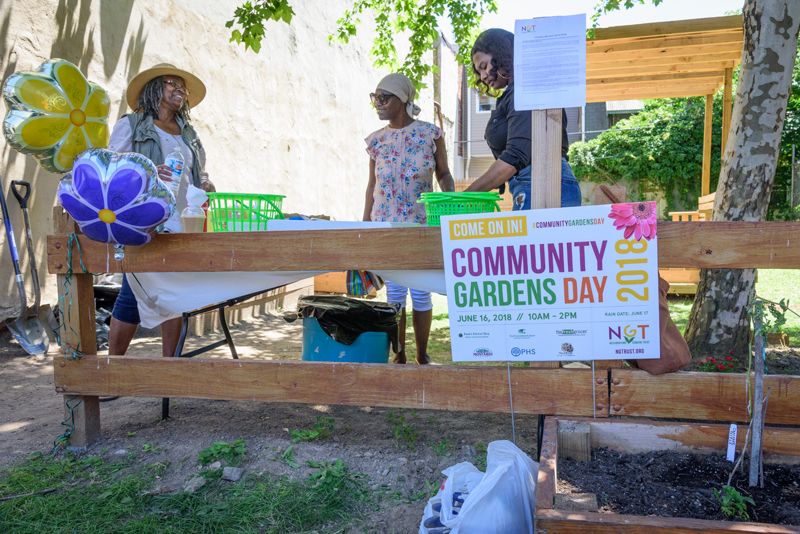 As Philadelphia’s neighborhood garden protector, NGT would acquire a nearby vacant lot from the PRA and then execute a land swap with the new owner, OTE Realty. NGT could then preserve the garden in perpetuity. Defending the garden took “a lot of frustration, prayer, and tears,” Tennille reflects. 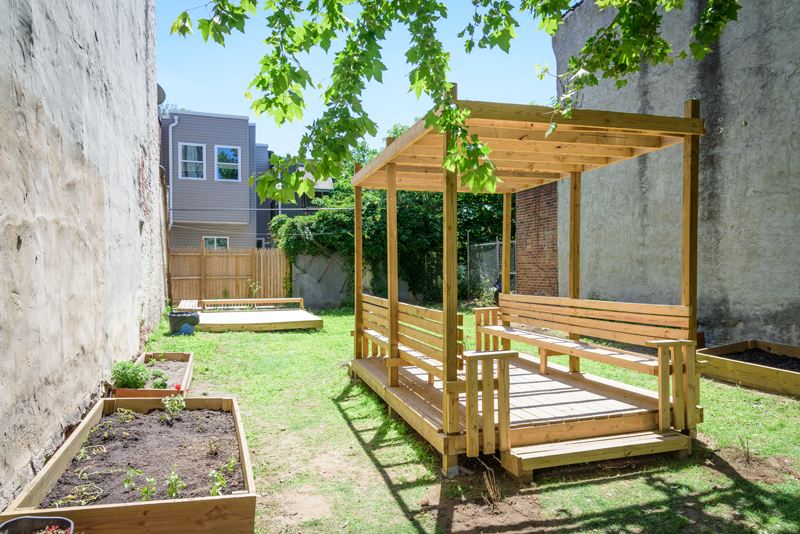 After initial talks broke down, she invited the new owner, Edon Shlomo of OTE Realty, to the South Philly Peace Garden and explained that the space was created to bring peace and calmness to a part of Philadelphia where some residents feel hopeless after decades of violence and neglect. Tennille’s determination and the serene atmosphere at the Peace Garden helped Edon to understand why many residents view the land as a sacred space. He assured Tennille they would work out a deal and that the land would be protected. On days that tested Tennille’s resilience, Chaz, her 10-year-old son, inspired her to keep fighting. Tennille says that the garden has played an important role in improving quality of life for families in the area. The garden, however, feels different. Chaz is not afraid there. Instead, he’s curious and excited to learn about nature through gardening and exploration. Chaz invested in the future of the garden from the outset. He even surprised his mom by participating in Pennsylvania Horticulture Society’s Garden Tender training classes and urging her to plant cantaloupe and tie-dye tomatoes, a bi-color heirloom variety. All the dedication and hard work have come to fruition. 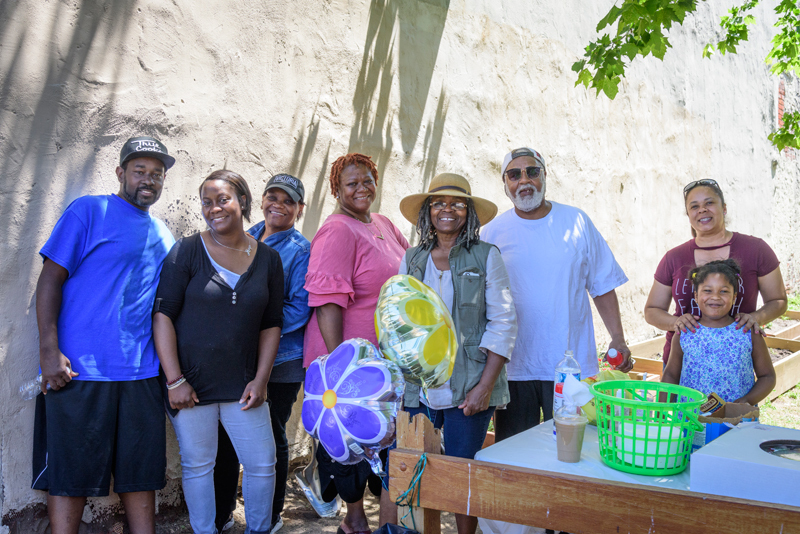 On July 24, 2018, the Neighborhood Gardens Trust came to the settlement table with OTE Realty to execute a land swap, ensuring the permanent protection of the Peace Garden. Thanks to a passionate community leader and an innovative public-private partnership, NGT now holds title to the South Philly Peace Garden, which will serve as a gift to the neighborhood for generations to come. Help NGT preserve more community-managed spaces. DONATE NOW.